Talyn Parker shined once again scoring four touchdowns on 20 carries for 283 yards Friday night against Rock Hill. The Trojans improved to 3-1 on the season and 1-0 in OVC play following Friday night’s victory against Rock Hill. Coming into Friday night’s battle against Rock Hill, Portsmouth head coach Bruce Kalb knew getting a win over the Redmen wouldn’t be easy. “We knew it was going to be tough” said Kalb after the game. To start off the game, Portsmouth would receive the ball only to go four and out and punt to Rock Hill. The Redmen had similar results on the first drive going four and out as well and punting the ball back to the Trojans. After a couple of slow drives by each team, Talyn Parker would come out for the first play of the second Trojan drive and take the ball 55 yards to the end zone to give Portsmouth a 7-0 lead and the momentum early. The score stayed at 7-0 entering the second, Portsmouth still holding the momentum as Rock Hill couldn’t get any offense going early. Midway through the second quarter, Parker would get the ball again on the outside taking it 45 yards to the end-zone for his second score of the game. Portsmouth lead 14-0 after the extra point. Towards the later portions of the half, Rock Hill would strike for the first time in the game on a 30-yard touchdown pass and extra point to put them within a touchdown at 14-7 in Portsmouth’s favor. The one touchdown deficit would not last for long though, as Kalb looked to Parker again on the next drive. Parker would not disappoint, running it in from 60 yards to give the Trojans a 21-7 lead with 5:05 remaining in the 2nd, only needing 25 seconds to score. Portsmouth would take that lead into the half, offensively led by Parker with 11 carries for 191 yards and three touchdowns. The first big action of the third quarter happened when the Portsmouth defense recovered a Rock Hill fumble with eight minutes remaining in the 3rd. Later that drive, the Trojans would convert a 4th down conversion with 5:30 left in the third, only to turn the ball over on downs a minute later. The Redmen would spend the remainder of the 4th quarter slowly but surely driving down the field to the 10 yard line. They would eventually drive all the way down to the 2-yard line, giving them a 4th and 2 in which they would go for it and be stopped inside the one-yard line, giving Portsmouth the ball back with 9:44 remaining on their own one with their backs against the wall. The Rock Hill defense was not discouraged by the near score, holding Portsmouth to only one yard on the drive and forcing them to punt from their own two yard line. The punt would be taken out to the 22-yard line, giving hope for Rock Hill in a must-score situation with only 6:25 remaining in the game. 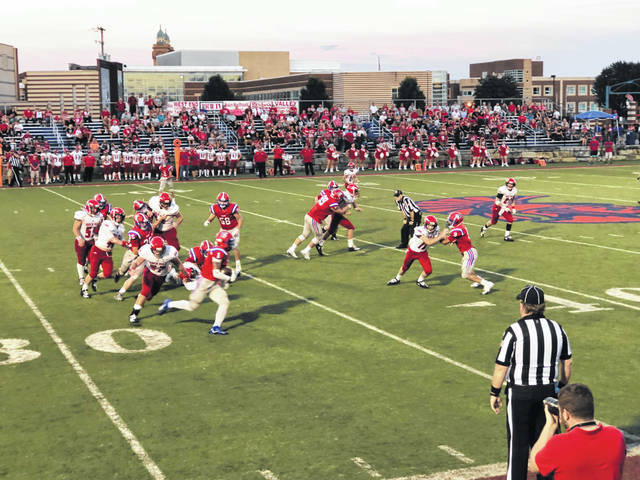 A few plays later, they would capitalize on the good field position and score a touchdown, cutting into the Trojan lead and making the score 21-14 with plenty of time left in the ball game. Kalb and the Trojans didn’t allow the score to stay within seven for long, after touchdown machine Talyn Parker cuts backwards up field and ran it in from 60 yards for the second time on the night, giving Portsmouth a 28-14 lead. The score would remain at 28-14 to end the game with the Trojan rushing attack being too much for Rock Hill. Parker finished the game with four touchdowns and 283 yards on 20 carries. 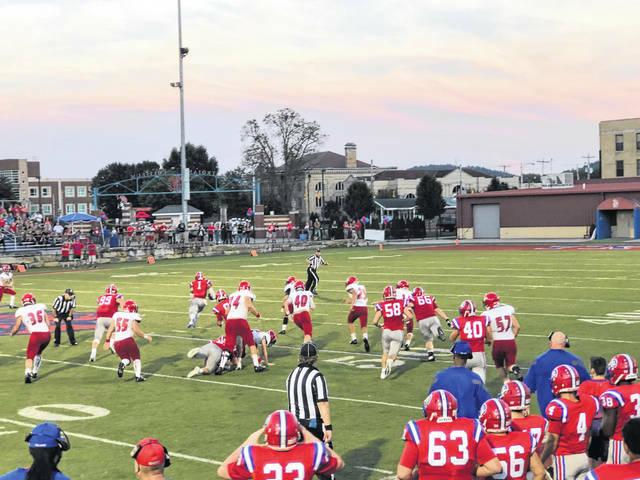 The Trojans will face Gallia Academy at home next week in their second OVC game of the 2018 season. “Our theme here is we got to keep moving forward every week” Kalb said. https://www.portsmouth-dailytimes.com/wp-content/uploads/sites/28/2018/09/web1_talynrush.jpegTalyn Parker shined once again scoring four touchdowns on 20 carries for 283 yards Friday night against Rock Hill. https://www.portsmouth-dailytimes.com/wp-content/uploads/sites/28/2018/09/web1_trojansredmen.jpegThe Trojans improved to 3-1 on the season and 1-0 in OVC play following Friday night’s victory against Rock Hill.